School's back in session, and lessons abound. In the Mineola School District in New York, the students of Jackson Avenue School are learning the important lesson of empathy, one gallon of water at a time. 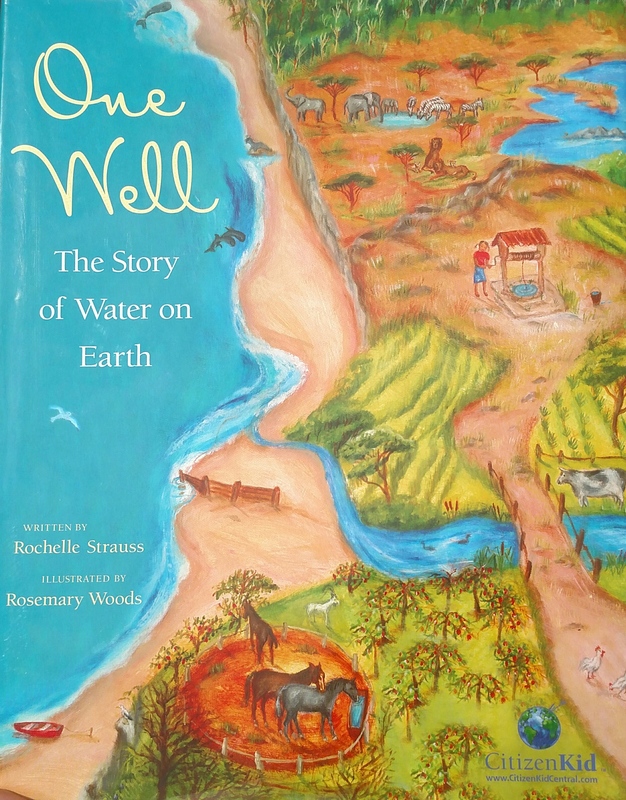 Over 250 third graders learned about the plight that other children face in underdeveloped countries after reading One Well:The Story of Water on Earth by Rochelle Strauss and decided to take action. Teachers at the school shared with their classes how other children their age must walk over 12 miles just to gain access to clean water. The students hadn't known that everyone couldn't just turn on a faucet at home. They learned that families depend on their children to bring water, often the water is not clean, and that many families suffer from lack of water. They also learned how important it is to conserve water in their own house, and how to avoid wasting the precious resource. They had so many questions: how heavy is a bucket of water, how far is 12 miles, and how does it feel to walk that far carrying buckets of water. And their most important question: How can WE help? Enter the "Walk For Water." Walk for Water is an annual event, championed by Superintendent Michael Nagler. 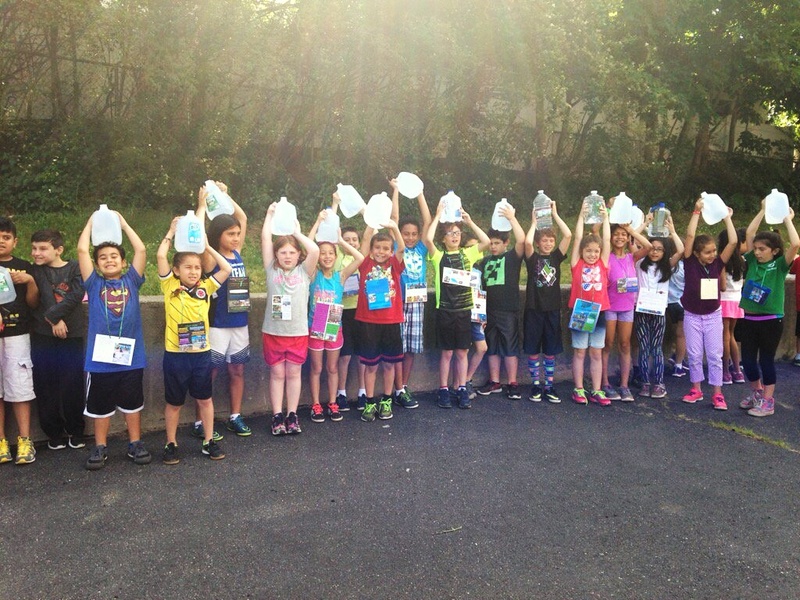 Each 3rd grader carried a gallon of water a mile, so they could experience just a portion of what other kids across the globe have to endure to access clean water. They felt the weight of a gallon in their tiny hands as they walked the mile, never complaining but often remarking, "I can't believe this is what the other kids have to go through." After they finished their walk, the children donated the water to Island Harvest Food Bank, a member of the Feeding America network of food banks. Community Outreach and Food Drive Specialist Doreen Principe explained that the water would go to some 28 local food pantries, senior centers, and children's agencies on Long Island. They would gladly share the water among the homeless, those not well enough to travel to the food bank for food and water, and those who on a hot day would appreciate the water immensely. Once the water was safely in the Island Harvest van, we jumped in our cars and followed it. I wanted to give a firsthand account of distribution to the selfless children, so they knew their water was going to good use. We followed the water to EAC Network's Hempstead Senior Center, the first of 28 stops on Long Island, where grateful Senior Citizens were waiting. They each got a cup of water, and were so tickled to learn that the water was donated by the children to learn empathy. I was interested to learn that the book One Well is part of a curriculum available to all schools in the United States, as part of ELA G3:M4:U1. If you don't know what that means, it's part of the Common Core Curriculum, for which all resources must meet certain standards in grades K-12. If you're interested in adopting One Well into your child's curriculum, along with the other empathetic books in the Unit, speak to your SuperIntendent about ELA G3:Module 4: The Role of Freshwater Around The World. If he or she is as wonderful as Dr. Nagler, the book & activity will be implemented in no time. Says Rochelle Strauss, the author who started it all, "When I wrote One Well, my hope was to inspire readers to get involved and take action, but to see firsthand the impacts my book had on this incredible group of students and teachers is truly amazing. They are the real change makers and hopefully will become an inspiration for others to take action, too." As the wonderful students, staff, and community of Mineola School District will show you, "Walk For Water" teaches lessons that go well beyond books. And as Principal Janet Gonzalez said, "the lesson of empathy is SO important for us to teach our children." It's a lesson that every single one of us can learn and put into practice, one drop at a time. For more celebrities, causes, & incredible nonprofit organizations, please visit Spotlight On Giving. What cause do you shine YOUR Spotlight On?